Successfully Added DVB-T USB Dongle - Watch and Record Digital TV to your Shopping Cart. 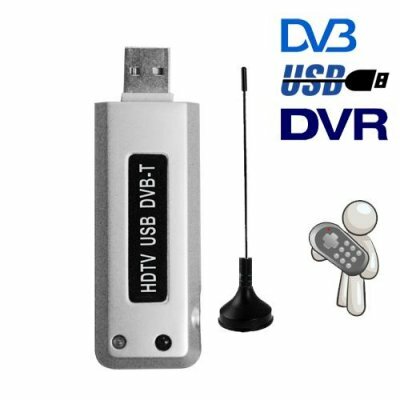 DVB-T USB Dongle for PCs, Notebooks or Netbooks - Watch Digital TV with this handy receiver and record programs with the included software. For roughly the price of a single DVD movie you can have both digital TV and a DVR on your computer. How cool is that? This remarkable USB accessory is actually the worlds greatest computer upgrade. By simply inserting the DVB-T dongle into any available USB port and then installing the software on the included disk, you are ready to just sit back, relax, and enjoy your teams latest match or your favorite TV show right on your desktop, notebook or netbook computer. Similar to today's popular PVR's, the software auto detects your DVB-T region and auto scans all available digital TV channels and adds them to your channel selection. Now you can flip through channels just like you do at home. Then, what's more, you can use the software like a DVR/PVR to record a program immediately with the press of a button or make use of the timeshift function and you've got yourself a modest TiVo alternative. This DVB-T dongle receives and encodes digital TV signals in MPEG-2 format for a quality picture everytime. Since you'll be using the dongle for your desktop PC, laptop, or sub-notebook, all your favorite programs are saved directly to your hard drive for easy access and convenience. At such a low price, buy one right now to test the DVB-T USB dongle for yourself and then order twenty more to resell to your online customers. Another innovative digital TV product from the leader in China wholesale electronics - Chinavasion. Note: DVB-T does not broadcast worldwide. Please check if DVB-T signals are available in your area before you purchase this item. Which DVB-T standard is supported with this tuner, MPEG2 or MPEG4 (H.264)? This unit supports DVB-T MPEG-2 broadcasts. Can I use this product with Vista? Unfortunately, the product is not compatible with the MS Vista operating system. Works perfectly in Germany. Thank you for this nice Item. Was my first order! and in the near future: Sky sports 1, Sky News, BBc 1+2+3 and lots more. +You can see tv listings! Record, Schedule to record and lots more! Very excellent item, and well worth the money! This item works perfectly well in the UK and can pick up channels such as E4, sky 3, Sky sports news, Living, History channel, and plenty of radio stations! The channels are crystal clear, and the software that comes with it allows you to record/pause live tv, and watch it whenever is best for you! If you live in a town where you have good reception for DTV, this attena will work perfectly fine, however if you live in a poor reception area, i suggest you get a Indoor/outdoor signal amplifier 20db gain, costs around 19GBP, but well worth the money. All in all, this is a must have! Free TV on the computer/laptop!